There’s nothing more satisfying than finding an easy way to do a difficult job! 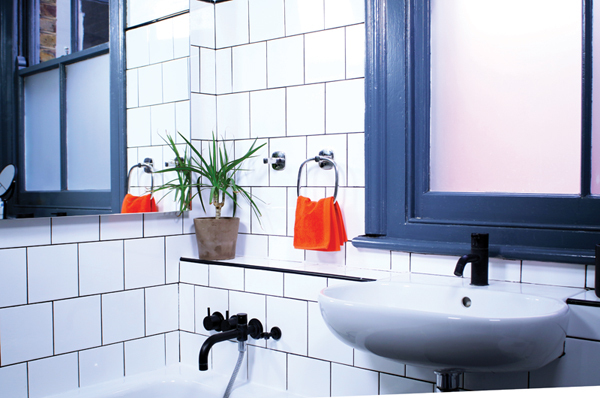 Sugru is waterproof and bonds brilliantly to ceramics and metals so you can easily install hooks, towel rails and loo-roll holders directly onto your tiles without any messy drilling. Hurray! Check out this short video and see how easy it is to do yourself. Bathroom fittings are often made in 2 parts: a mounting bracket and a nice chrome part. This is a clever design solution that hides ugly screws from view. You can use Sugru instead of screws, making this job a whole lot easier. Roll one single-use pack of Sugru into a ball and divide it into three equal pieces. Press Sugru firmly onto the back of each of the screw holes on the mounting bracket and shape them into pyramids. Press the bracket firmly onto the tiles so that Sugru pushes through the holes and out the sides. Note: Sugru will work on most surfaces. On walls, it's best to go for tiles, as paint may come off. Press Sugru back onto the bracket and clean away any excess. If the bracket is heavy, use masking tape to hold it in place then leave Sugru for 24 hours to fully set. Note: Quick test: Make sure the hook fits over the bracket before leaving it to set. 24 hours later, install the chrome hook over the mounting bracket. This is usually held in place with a small grub screw on the underside of the hook. 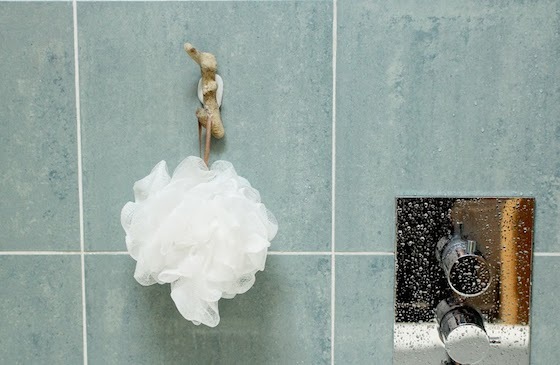 More ways to hack your bathroom better! 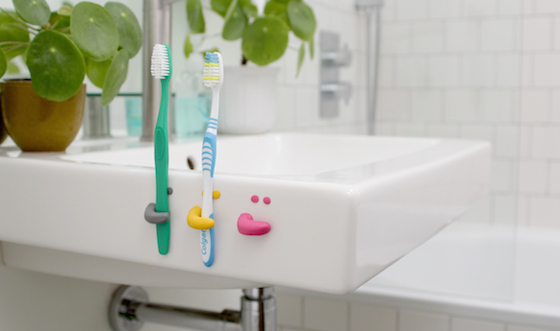 Free up some space around your sink by making these handy smiley Sugru face toothbrush holders, perfect for small bathrooms. Everyone could do with more places to store things in the bathroom, but drilling tiles just to add a hook is pretty drastic! 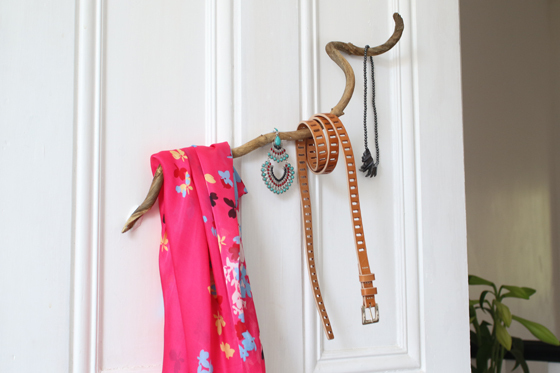 Keep your stuff organised the easy way using Sugru to turn almost anything in to a handy hook - here we've used a piece of coral we found washed up on the beach. 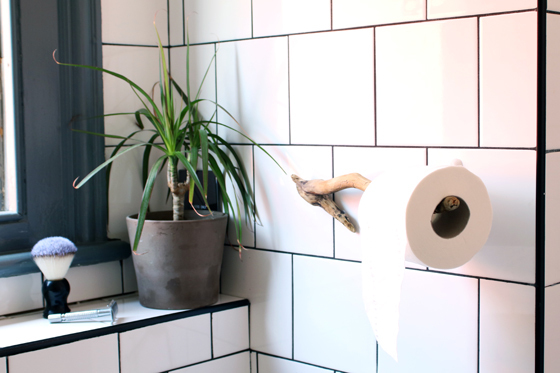 You know what they say, life's too short for wonky loo roll holders (ok so we might have made that bit up). But with Sugru it's easy and fun to come up with your own clever solutions to problems. Like using a piece of driftwood as a storage solution. And you can do all these cool projects with our new kits. A new, quirky way to display your favourite mugs in the kitchen.